Most employers would agree that drug screening has a valuable role to play when it comes to promoting health and safety in the workplace. However, despite its value, implementing an effective drug testing programme can prove challenging and drug screening is sometimes seen as more of a hindrance than a help. Traditional point-of-care drug tests – which usually involve the collection of urine or saliva samples – may take more time, planning and expense than is perhaps necessary to support a company’s drug screening policy. In my previous blog (Workplace Drug Testing: A Health and Safety Must?) I highlighted the importance of drug screening in order to keep workplaces safe. Here I will discuss the alternative to conventional urine and saliva drug screening methods, to consider if there is a better option. Whether for pre-employment screens, random testing or post-accident investigation, traditional workplace drug screening technologies typically require the collection of urine, saliva or blood for testing. In this blog I will be focusing on screening tests which are most commonly used by employers to provide rapid results without the need for laboratory testing. Urine and saliva tests are the most common methods of screening employees for drug misuse and they are frequently used for point of care testing, where a sample is collected and analysed in-situ. However, urine and saliva tests have their drawbacks and carrying out these tests is not always as quick, simple or cost-effective as is initially hoped. Drug tests detect drugs or drug metabolites which are present in body fluids as a result of normal metabolic processes. Whenever we ingest something our bodies process, or metabolise, what we’ve ingested to produce secondary chemicals (metabolites) which are detectable in blood, urine, saliva and sweat. The metabolites we produce are specific to the substances we have consumed and traditional drug tests work similarly by screening for drugs and drug metabolites in body fluid samples. Urine or saliva testing can be invasive, time-consuming and undignified. For urine-based tests, sample collection is sometimes observed in order to reduce the chance of sample adulteration or substitution. This requires gender-specific collection staff and specially prepared collection areas, increasing the cost of screening and limiting employers’ ability to carry out spontaneous or off-site testing. Oral fluid testing is simpler and more versatile than urine screening but saliva is also biohazardous and can prove difficult to collect if an individual has a dry mouth, which is a common side effect of several illegal drugs. Once a test is complete, the tester is left to dispose of the sample. Handling and disposing of biohazardous body fluids and bulky body fluid collection kits is an unpopular, messy task that could increase the cost of each test. Another way to screen for drug misuse is to collect and analyse a person’s sweat. In common with body fluids like urine and saliva, the sweat of a drug user contains tell-tale drugs or drug metabolites which have been excreted by the body. These substances are detectable in minute amounts of sweat, even in the traces of a person’s fingerprint. 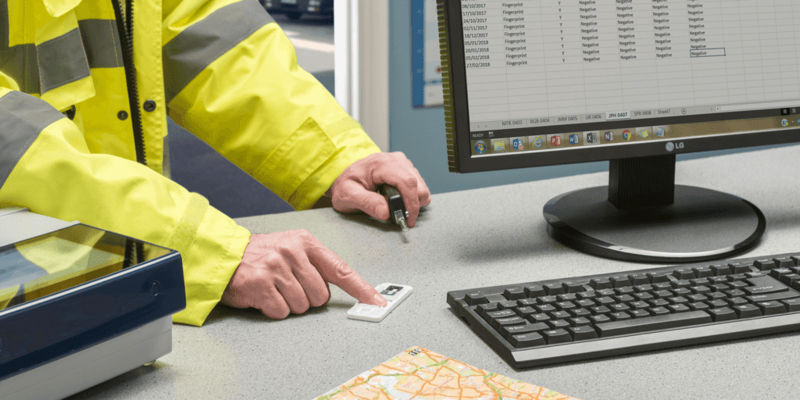 Here at Intelligent Fingerprinting we have developed the world’s first portable fingerprint drug screening system, a simple yet versatile new technology which can be deployed wherever it is needed. Fingerprint drug testing is non-invasive, quick and cost-effective, with none of the mess or biohazards associated with other methods. This makes it ideal for all types of workplace drug testing including pre-employment screening as well as random and for-cause testing, whether in the office or off-site. 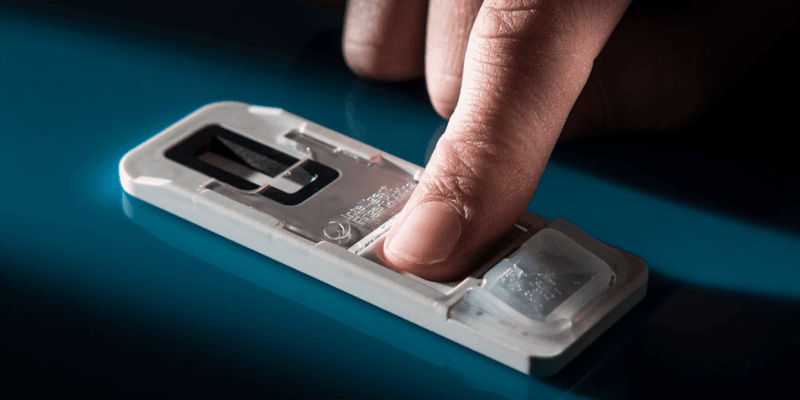 The Intelligent Fingerprinting Drug Screening System consists of a 4-panel Drug Screening Cartridge – for 5-second sample collection – and the portable Reader 1000. From a single fingerprint sample, the System screens for cannabis, cocaine, opiates and amphetamines simultaneously in under 10 minutes. Our dignified, fingerprint-based test can be overseen by one person, with minimal training required and with none of the privacy or waste disposal issues associated with conventional body fluid tests. The portable Reader 1000 provides a clear positive or negative result for each drug in the test, removing any risk of bias or incorrect interpretation by the user. To provide a sample, the person being tested simply presses their fingertip onto the disposable Cartridge for five seconds. The tester closes the tamper-evident Cartridge cover to protect the sample. The Cartridge is activated and placed into the Reader 1000 for analysis. A positive or negative result is provided on-screen for each drug in the test. The whole process, from start to finish, takes fewer than 10 minutes. When analysis is complete, the Cartridge can be removed from the Reader and discarded with general waste. We believe that fingerprint-based drug screening will change the way we undertake drug testing in the workplace for good. To find out more about Intelligent Fingerprinting please watch our short introductory video or feel free to get in touch.